Not much interest in the Royal Wedding playing out on the screen in the background…! 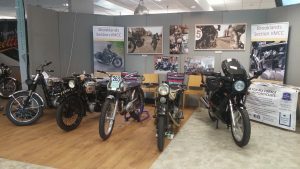 We had a good day at the Southern Classic Show this year. Our stand was in a great location and looked smart, thanks to John Gentleman’s efforts in setting it up on the Friday. 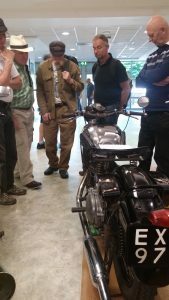 We had a broad mix of bikes on the stand: two pre-war (BSA and Panther), Neal Young’s Street Scrambler A10, a lovely little James trials bike and a Honda XBR500. 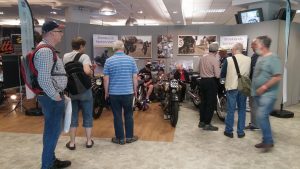 There was a lot of interest and discussion from visitors to the stand and, to my surprise and delight, my 1938 Panther M100 won a “Highly Commended” rosette.